Zoom in, squares: g > 29, orange circles: M* > 1010 M_solar. 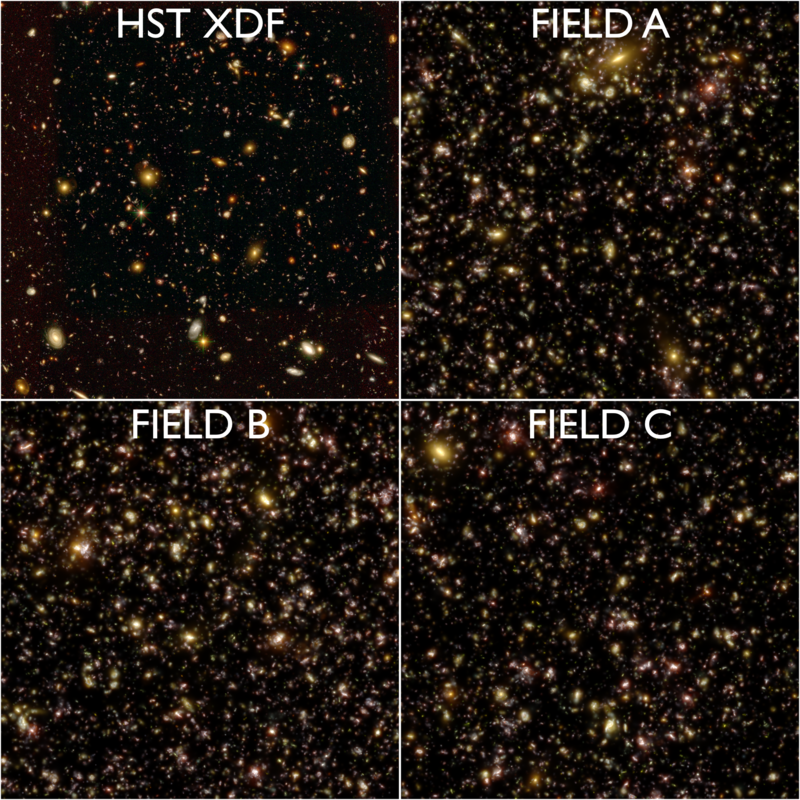 Mock fields and the HST Ultra Deep Field in the same color scheme. 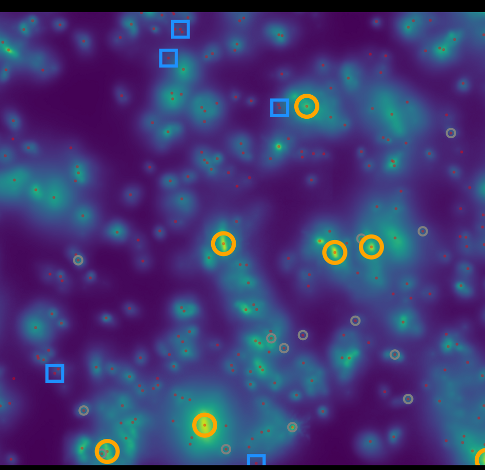 Small region of HST & JWST color composite of FIELD C.
This page hosts synthetic deep survey images from the Illustris Project cosmological simulations of galaxy formation. By projecting a line of sight through a periodic volume, we constructed realistic mock surveys which preserve the predicted geometry of the simulations. With the emergence of large hydrodynamical simulations of galaxy formation, we can now create these mock galaxy surveys with detail down to the size scales and distances revealed by HST, and in the future, those JWST and WFIRST will reveal. The Illustris Project consists of hydrodynamical simulations of galaxy formation in a volume 106.5 Mpc across, with detail resolved down to sub-kpc scales. Using the Arepo code, Illustris applied galaxy physics consisting of cooling, star formation, gas recycling, metal enrichment, supermassive black hole growth, and gas heating by feedback from supernovae and black holes. 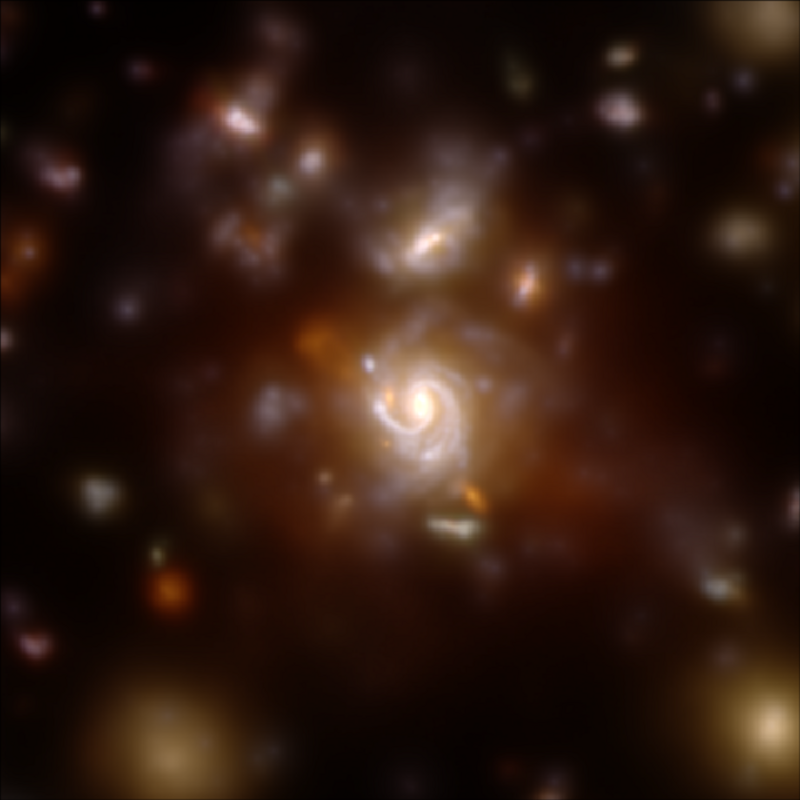 By converting simulations like these into synthetic observations, we can interpret HST observations with complex models of galaxy assembly, plan ahead for future missions, and directly contrast valuable survey data with our theoretical understanding of the physics behind the formation of galaxies. Here, we present three "mock ultra deep fields", each 2.8 arcminutes across, in common wide filters used by HST, as well as in filters expected to be used widely by observers with JWST and WFIRST. 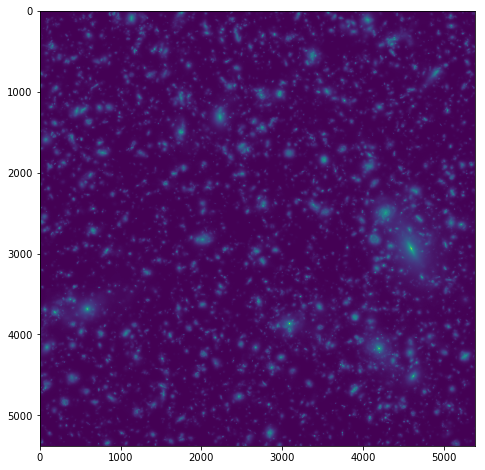 For HST and JWST simulations, we provide images with and without convolution by model PSFs. For each image, we also provide the simulation catalog from which we generated each image, enabling users to locate sources, link them to intrinsic simulation quantities, and conduct analyses across observation and theory space. <instrument> = "hst-acs", "hst-wfc3", "jwst-miri", "jwst-nircam", or "wfirst-wfidrm15". <field> = The geometry/selection, described below. <filter> = The filter, e.g., "f435w". The geometry/selection of these three fields is derived from the three "Thin" lightcones defined in Snyder et al. (2017). For example, "mag30-fielda-11-10" corresponds to Field A from that paper. The string "mag30" refers to the selection of Illustris subhalos included in the mock image. For these files, the selection is based on the rest-frame g-band apparent magnitude of the source, such that g < 30.0. "IMAGE_NOPSF": Raw image without PSF or noise. "SimulationAssumptions": URL links to Illustris documentation and API. "MockDataAssumptions": Header contains code and parameter choices for creating mock images. "IMAGE_PSF" : [Optional] Same image, now convolved with model PSF from TinyTim or WebbPSF. "MODELPSF" : [Optional] The PSF model at the same pixel scale as HDU 3 "IMAGE_PSF". "Catalog" : Lightcone Catalog, containing intrinsic simulation info, including galaxy ID numbers, image positions, and other info. "CatalogDocumentation": Strings containing explainers of catalog columns. For more information, consult the README file and the GitHub repository. You can download the FITS file(s) of interest from the pages below.